I am new to the forum and recently purchased a 1948 Mills Hightop 10 Cent slot machine that was not in working condition. I have been working on it and had some issues along the way that I have already posted a few questions on, but am now having a different issue. I am having an issue when a jackpot pays out the handle won't pull on the next coin. When I pull the mech out I am noticing that the vertical bar in front of the payout slides (sorry don't know the name for this part) with the wire tension is pushed over too far on the bottom left. When this happens the next pull come straight down on that piece and it won't move out of the way. I tried to look online at what might be causing this, but any of the examples of the machines I have seen don't even have this part....or I cannot see it. Unfortunately this part is part of the cover for the slides so it cannot be removed...any maybe it is not supposed to. Since the machine was not working properly when I got it I am not sure this part ever work correctly or if I have it installed right. Also to be honest this might not have anything to do with the jackpot, but prior to testing the jackpot payout I could play coin after coin without an issue. Please see the picture, but any help with this would be appreciated. That part can be removed with out causing any problems. In fact it will work better with it removed. It is a anti cheat lever. They will cause problems when they become worn. There are a lot of machines that have it removed. Cut or grind the rivet. Last edited by oldslotman on Sun Nov 11, 2018 8:47 pm, edited 1 time in total. 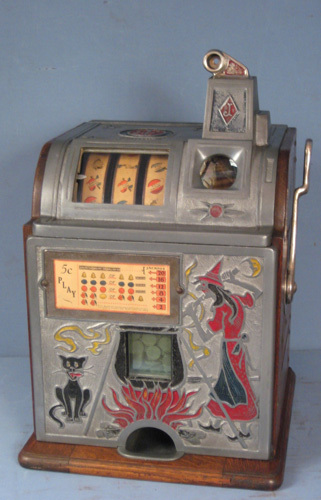 CoinOpNick wrote: I am new to the forum and recently purchased a 1948 Mills Hightop 10 Cent slot machine that was not in working condition. I have been working on it and had some issues along the way that I have already posted a few questions on, but am now having a different issue. I am having an issue when a jackpot pays out the handle won't pull on the next coin. When I pull the mech out I am noticing that the vertical bar in front of the payout slides (sorry don't know the name for this part) with the wire tension is pushed over too far on the bottom left. When this happens the next pull come straight down on that piece and it won't move out of the way. I tried to look online at what might be causing this, but any of the examples of the machines I have seen don't even have this part....or I cannot see it. Unfortunately this part is part of the cover for the slides so it cannot be removed...any maybe it is not supposed to. Since the machine was not working properly when I got it I am not sure this part ever work correctly or if I have it installed right. Also to be honest this might not have anything to do with the jackpot, but prior to testing the jackpot payout I could play coin after coin without an issue. Please see the picture, but any help with this would be appreciated. Here is a picture of the 10 cent high top I have. Thanks for the response. I am not sure why five cent slides would be put in a ten cent machine, but I am still new to all of this. In regards to the other part I was talking about, I assume it is not normal to have that part that far to the left or in front of the slides. CoinOpNick wrote: Thanks for the response. I am not sure why five cent slides would be put in a ten cent machine, but I am still new to all of this. In regards to the other part I was talking about, I assume it is not normal to have that part that far to the left or in front of the slides. No that is not normal. If you buy a machine there is no telling what the other people had done to it. I seen what I call frankstein machines which are made up from many different machines and most of the time they are screwed up. Try putting a nickel in the payout slide. You may a 5 cent machine with a 10 cent escalator in it. So I think I figured out why that part is going over too far. When I took apart the payout slides the posts had what appeared to be on it cardboard washers, but some where missing or I lost them. So I used washers. It appears the washers where too high causing the part to not stop at the notch in the subfloor. When I took out the washer on that side that part now stops. After that I was able to get the jackpot to drop and even tried one payout for three plums and it paid out perfectly, but then when I tried other payouts it stopped working. So I will look at the slides more closely and then report back on the other thread I have in regards to the payout issues. Thanks for your help.